Face painting is great fun to do and so easy to learn. Anyone can enjoy face painting you don’t need to be an artist. Before you start, have a good understanding of face painting safety, please read below. FAS Professional Face Paint is a cosmetic pigmented paint (STD COLOURS) that have been formulated specially for use on skin, they are non-toxic and have been carefully tested. FAS use cosmetic pigments in the manufacturer of the FAS Professional Face Paint. However, if you suspect that your skin or your models skin may have sensitive skin you could test the paint on the inside of your wrist before you begin. If there is no reaction after a few minutes will be safe to proceed. Just as some people have an allergic reaction to bee stings and other do not, everyone is different! So, keep and eye on your models skin as you paint. If your models skin becomes itchy or irritated, you will need to instantly remove the face paint and apply a barrier cream. Even then a few people have still have a reaction to the barrier cream and it is best not to apply the face paint in this case. If you are intending to wear face paint for long periods of time, you may need to reapply your colours and use a barrier cream or moisturiser to assist with removal and protection of your skin. Keep paint away from eyes, mouth and nose. Always be very careful when painting in these areas. It is a good idea to have your model close their eyes until you have finished painting. Don’t use paints or glitter paints that are intended for painting on paper. As these products are not likely to be cosmetic grade. FAS Professional Face Paint will wash off with soap and water. Avoid getting face paint on clothes as it will wash off skin but it could stain some fabrics. Keep all brushes and utensils wet while working. • Have plenty of tissues or moisture wipes ready. • Have plenty of water on hand for cleaning your brushed and sponges. • Use hair bands and clips to hold your models hair back and out of the way while you paint. • Have you model sitting high enough for you to work comfortably. • Always start with a clean dry face. • Make sure you have a good idea of what you are painting before you start. • Have all your equipment laid out on front of you for easy access. • Change your water for cleaning often. • Try applying your lighter tone colours first and progress to the darker tones. • When using sponges try to have one for each colour, as this quickly gets very messy. • Wait to the first colour is dry before applying your next colour. Wet paint on wet paint will smudge. You can apply the FAS Professional Face Paint with fingers, sponge or a brush directly from the jar. 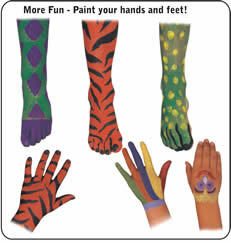 Professional face painters always have plenty of water, brushes, sponges, clean towels, tissues or wipes, mixing pots or palette, a mirror, book of face painting designs that they paint. You will need a selection of different size brushes, some for painting and others for effects. Sable hairbrushes are best but nylon brushes will work perfectly well. Some people prefer flat and others round brushes, but the important thing is to a good selection of sizes. If you can, try to have one brush for each colour you are painting or thoroughly wash out the brush between colours. Buy make-up sponges made from soft foam. You can cut larger sponges into smaller wedge shapes. Sponges are ideal for applying your base coat or large areas of one colour. Again, it is best to have one sponge per colour, as things get messy very quickly. 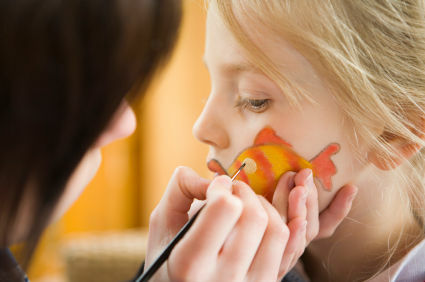 Most professional face painters prefer mix the basic colours to create their own colours. For this you will need a mixing tray or pots. You can cover the tray with a cling film or put the lid on the jars to reuse the paint later. You may need to add water to revive these colours. It is hard to make mistakes in face painting. Its all about having fun! You will need a jar of water, clean sponge or brush and paper towels. For more complex designs try doing sketch first or make a stencil out of plastic or card. Try to paint thinly as the skin is a flexible surface, thick and heavy coatings may crack. Place an old towel or paper towels around the shoulders. Have your model relax their face - no squinting. HAVE FUN! If you do not have all the colours you need, try mixing the colours together to make a new colour. Mix on the back of your hand or in a saucer. See our mix and match colour guide. To add additional colours next to or over the first colour allow Face Paint to dry. Paint your lighter colours first. Paint your details with your make-up brush. Make sure you wash your brush between colours or have a brush for each colour. Paint carefully around eyes and never go too close with your brush. Try cotton buds/swabs for easy control. Sponges or cotton wool is used to apply a smooth base colour over the face. Sponges need to be just damp with water and not drippy. Have your model relax and close their eyes as if they were sleeping. Dip the damp sponge into a little amount of face paint and using a either a brushing sweeping action or dabbing, apply to the face. Try starting from the top of the forehead and sweep with one long stroke to the point of the chin. If you want a duotone (two colour), always apply the lightest colour first. The second colour can be blended in by lightly dabbing along the adjoining edge. Wash sponges between colours or have a sponge for each colour. FAS Face Paint is best suited to synthetic or sable brushes. Try to paint thinly as this will avoid any cracking and allow the face painting to last much longer. Use a fine thin brush for fine lines. Try to keep your lines continuous with confident brushing rather than broken and sketchy.